Robert Irving Elliott was born on November 26, 1916, in San Francisco and grew up in El Centro, California. His parents were Irving Elliott, a plaster plant superintendent, and the former Anne C. Johns; Robert was one of four children. In his early years in California, Elliott was a student at Harding Grammar School, Wilson Junior High School, and Union High School. At Union he played football and baseball, then took up these same sports at El Centro Junior College. Elliott began his career in professional baseball with Savannah of the Class B South Atlantic League in 1936. In 144 games, he hit 12 homers and knocked in 84 runs while batting .292. Before the 1937 campaign, his rights were acquired by the Pirates as part of a minor-league working agreement. While with Savannah during the ’37 season, Elliott showed good speed in legging out 16 triples. He was chosen as a SALLY League All-Star that summer, repeating an honor earned the previous year. Still just 21 years old, Elliott was sent back for a third season of minor league seasoning in 1938. He played 11 games with Knoxville of the Southern Association, then was returned to Savannah to play the bulk of the summer. Now a familiar face to Georgia fans, he batted .325 with 30 doubles, 11 triples, and 12 homers in his third year with the club. After playing only 14 games with Louisville, Elliott was optioned to Toronto of the Double A International League. In 115 games there in ’39, he batted .328 with 27 doubles. Brought up by Pittsburgh at the end of the season, he made his major-league debut on September 2, an 11-3 win against the Cardinals in St. Louis. All he did in that game was homer into the left-field bleachers and collect three runs batted in. He got his first major-league hit off Clyde Shoun, a single that Cardinals outfielder Enos Slaughter misplayed, allowing Elliott to wind up on third base. As recounted by Arthur Daley of the New York Times, Frisch hit some grounders toward Elliott to give the young player some practice at third base: “Elliott gave the first couple of grounders the Pie Traynor treatment, beautiful pick-ups and throws. But the next one struck a pebble and smacked him squarely between the eyes. Down he went -- out cold. The frantic Flash poured a bucket of water over him. Bob blinked and sat up. Another account of the incident claimed that Elliott was refused for military service in World War II because of head injuries he sustained playing baseball in 1943. In support of the war effort, Elliott joined Elvin “Buster” Adams of the Philadelphia Phillies working for Consolidated-Vultee Aircraft Corp. in San Diego during the 1943 offseason. While never known principally for his defense, Elliott did develop into what the Times’ ‘Daley called “a mighty fine third baseman” in spite of his growing pains. A 1951 profile written while Bob was with Boston called Elliott “one of the coolest customers around the hot corner in the National League” and made note of his “sharp fielding.” The stats support these claims; although he led the NL with 36 errors at third the year he was moved there (1942), he cut them by one-third the next year and never approached the total again. Durability was another Elliott trademark. Once he became a regular with the Pirates in 1940, he never played in fewer than 140 games with the team through 1946. He batted in more than 100 runs in every season from 1943 through 1945, and on July 15 of ’45 hit for the cycle. His speed was also evident: Elliott hit 10 or more triples in four different seasons with Pittsburgh, and his 13 stolen bases in 1940 led the team. Elliott represented the Pirates at in the 1941, 1942, and 1944 All-Star Games, and was named to the unofficial All-Star team in 1945, a season in which wartime restrictions forced cancellation of the game. That change of scenery took place after Elliott endured a subpar 1946 season, by his standards (.263, 5 homers, 68 RBIs). On September 30, the day after the end of the season, the Pirates traded Elliott to the Braves along with Hank Camelli in return for Billy Herman, Elmer Singleton, Stan Wentzel, and Whitey Wietelmann. Even though Herman would later go on to manage in Pittsburgh, the trade really did not benefit the Pirates on the field, as Herman played in only 15 more major-league games and the other three players appeared in a total of only 127 games for the Pirates. For the Braves, however, it proved one of the best swaps in team history. According to Al Hirshberg: “[T]he Pirates had two ball players who interested the Braves to no end. One was Ralph Kiner, a rookie outfielder whose 23 home runs led the National League in 1946 and who gave every indication of being well on his way towards fame and fortune.… The other Pittsburgh ball player who intrigued the Braves was Bob Elliott.… Of the two, Southworth’s first choice was Elliott, in spite of the slugging potentialities of the youthful Kiner. The Braves manager was thinking about the empty hole that would be left at third base with Herman gone. The Pirates didn’t want to give up either of their stars.…. [The Braves brain trust] pointed out that the big Californian wasn’t happy in Pittsburgh, which was true.…. Although he finished in the top 10 in the National League’s MVP voting in every year from 1942 through 1944, Elliott’s performance in 1947 put him over the top. He batted .317, hit 22 home runs, had a career-best 113 RBIs, and seemed to always make the key hit or fielding play when the Braves needed it. In the MVP balloting, Elliott received nine of the 24 first-place votes and 205 total points, outdistancing second-place finisher Ewell Blackwell of the Cincinnati Reds by 30 points. “Mr. Team” became the first NL third baseman ever to win the award as well as the first player from a non-pennant-winning team to earn the NL honor since 1938. A November 1947 newspaper account remarked that Elliott being voted MVP was “a surprise selection if ever the old circuit had one” and concluded that “the Boston infielder’s all-around record impressed the committee sufficiently to make him the first third-sacker and the first member of the Braves to gain the official most valuable player award of the National League.” During his breakthrough season Elliott did not lead the National League in any statistical category, although he was second in batting and doubles (35), sixth in on-base percentage (.410), and fourth with his career-high RBI total. The article said that most clubs would have preferred not to have their player win the MVP award, fearing that it might lead the winner to hold out for more money. Yet, in Elliott’s case, he signed a new contract for $30,000 shortly thereafter. He was still far from the six-figure stratosphere inhabited around that time by Joe DiMaggio and Ted Williams, but he was among the top-paid players on a club filled with veterans. After another 100 regular-season RBIs in 1948 -- capped by his pennant-clinching home run -- Elliott had a few more big blows in the World Series versus the Indians. With the Braves trailing three games to one, and a then-record 86,288 fans watching at Cleveland, he hit two homers to pace an 11-5 Boston win in Game Five. In the top of the first inning, his three-run shot off Bob Feller gave Boston a 3-0 lead; two innings later, he hit a solo blast off Feller. The Indians wound up winning the sixth game and the series back in Boston, but “Mr. Team” finished the fall classic with seven hits, five RBIs, and a .333 average. His Game Five heroics made up for some defensive gaffes by Elliott earlier in the Series. He made three errors at third base during the first two games, and the press was quickly on his heels. It was unknown to the public at the time that Elliott’s father was “critically ill,” causing Bob to travel to California to be with his dad before the series opened in Boston. Elliott was intent on keeping the matter private at first, but an unnamed teammate revealed the situation to the media. “Maybe [Elliott] thinks it’s a personal matter,” said the teammate. “Or it may be he’s afraid someone will think he’s trying to cop an alibi. But it’s time people who have been inclined to label him a flop hear it.” The teammate said that Elliott and his father had an especially close relationship: “Really, they have been more like a pair of brothers sharing each other’s thoughts and ambitions.” After Game Two, Elliott played errorless defense and set World Series records for chances accepted at third base (28) during a six-game series as well as the most chances accepted cleanly (25). 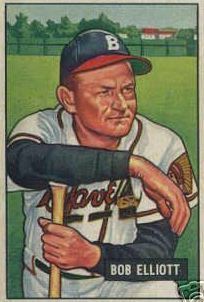 Although the Braves fell from their lofty heights in 1949 and never captured another pennant in Boston, Elliott stayed one of the team’s top offensive contributors. One highlight for Bob in his remaining years with the club was hitting three home runs in a game on September 24, 1949, and his 76 RBIs that season gave him the distinction of having driven in more runs during the 1940s (903) than any player in the majors. He started off the next decade in similar fashion (with 24 homers and 107 RBIs in 1950), but his performance slipped a bit in 1951. Although his offensive numbers were down, he was still chosen as an All-Star that summer, the third time has a member of the Braves and his seventh overall. The timing of his dispute couldn’t have been worse for Elliott, coming on the heels of his subpar season and with the team losing money due to a dramatic drop-off in attendance. Thus “Mr. Team” was likely not surprised when, past his 35th birthday, the Braves traded him to the New York Giants on April 8, 1952, in return for relief pitcher Sheldon Jones and $50,000. He also thought that St. Louis Browns manager Marty Marion would give him the most playing time, and managed to get himself invited to the club’s 1953 spring training camp. After Elliott hit a three-run homer for St. Louis during a 10-6 exhibition loss to the Cubs, team president Bill Veeck was so impressed that he signed Elliott to a one-year contract with the team just before the season began. Still, his switch to the AL did not rejuvenate Elliott’s skills. He played part time at third base with the Browns for 48 games in 1953, and was hitting .250 when on June 13, he was traded along with Virgil Trucks to the Chicago White Sox in return for Darrell Johnson, Lou Kretlow, and $75,000. After battling strained leg muscles during his time with the White Sox, for whom he batted .260 with little pop, he was released by Chicago after the season. Elliott finished his major league career with 2,061 hits, 170 home runs, 1,195 RBIs, and a .289 batting average. Like many ballplayers in the days before big-salary contracts, he was itching to keep himself in spikes and paychecks when his big league days ended. In 1954 he returned to his native California and suited up for the San Diego Padres of the Pacific Coast League. In 81 games, Elliott batted .256 with 12 home runs and 39 RBIs, and helped the Padres to the PCL regular season pennant by hitting two home runs in the clincher. The popular star next made a quick transition to managing, piloting San Diego in 1955 (a second-place finish), 1956 (seventh place), and into the 1957 season before being replaced by George “Catfish” Metkovich on May 16 with the club in sixth place. He went on to lead the Sacramento Solons of the PCL to a fourth-place finish in 1959, a half-game behind San Diego, before getting the chance to return to the majors and manage the Kansas City Athletics in 1960. Kansas City’s owner, Arnold Johnson, died just before the season began, however, and it was a year of upheaval. The A’s ended the ’60 campaign with a 58-96 record and an eighth-place finish in Elliott’s only season as a big-league manager. Two of Elliott’s coaches with that team were former big leaguers Fred Fitzsimmons and Walker Cooper. After the Athletics replaced him with Joe Gordon, Elliott went back to the West Coast to coach for the expansion Los Angeles Angels in 1961. This season was Elliott’s last in major-league baseball; he went on to work for a beer distributor in Indio, California, while maintaining his home in San Diego. In his spare time, he liked to fish and bowl. He would not get to enjoy these pastimes for long, however. Elliott suffered a ruptured windpipe in the spring of 1966, and in spite of receiving several blood transfusions and undergoing surgery for hemorrhaging in his stomach and lower esophagus, he died at Mercy Hospital in San Diego on May 4, 1966, at the age of 49. He was survived by his wife, the former Iva Reah Skipper (whom Elliott referred to as Skippy); daughters Judith and Cheryl Lynn; and two sisters. Schiffer, Don, My Greatest Baseball Game: New York: A.S. Barnes and Company, pp. 63-66. Elliott’s biography and World Series statistics on baseball-reference.com, retrosheet.org, and thebaseballpage.com. Hugh Bradley, “Worry Over Sick Dad Cause of Elliott Lapses.” 1948. “Bob Elliott, Ex-Star of N.L., Dies at 49 On Coast” Baltimore Sun, May 5, 1966. “Bob Elliott -- San Diego, Manager.” No citation information given. “Braves’ Officials Praise Elliott: Letter of Many Words from Club Seen as Effort to Influence Most Valuable Player Votes,” October 13, 1947. Robert L. Burnes, “The Bench Warmer,” June 7, 1953. Arthur Daley, “The Comeback Kid,” July 6, 1953. Dave Egan, “Braves Betray Elliott: Lockout Unfair to ‘Mister Team,’” March 26, 1952. “Elliott Hurt By Batted Ball,” June 22, 1943. “Elliott Most Valuable National League Player,” November 1947. “Elliott of Braves Most Valuable in National League Last Season,” November 1947. Gene Mack, Jr., “All-Star in 1951, Elliott ‘Forgotten’: Baffled by Braves’ indifference,” April 5, 1952. Jack Hernon, “Homers Elliott’s Trade Mark,” Pittsburgh Post-Gazette, May 2, 1952. Tommy Holmes, “Elliott of Pirates Has Right to Kick: Offensively, Bob Outdid Bill Johnson All-Star Selection at Third Base,” January 14, 1944. Harold Kaese, “Elliott Not Too Fond of Playing Outfield, but If Leo Says So…,” April 10, 1952. Ralph Kiner, “Kiner’s Liners,” Pittsburgh Press, June 19, 1952. Jim McCulley, “Elliott Losing Jitters, Pays Off for Giants,” June 1, 1952. Obituaries, “Bob Elliott, MVP in 1947, Former Pilot of Athletics,” May 9, 1966. “Pirates Cashing In on Player Shifts,” April 23, 1942. Porter, David L., ed., “Robert Irving Elliott,” in Biographical Dictionary of American Sports. “Robert (Bob) Elliott.” No citation information provided. Robert Irving Elliott, Pirate Personalities, Pittsburgh Baseball Club. J.G, Taylor Spink, “Looping the Loops: Elliott Finds Differences in Two Majors, The Sporting News, June 3, 1953, p. 2. “Split With Phils: Bob Elliott Clouts Grand-Slam Homer,” 1945. Sunday News, May 23, 1948, p. 17. Summary and photos of Elliott’s career. “Veeck Signs Bob Elliott After Home-Run Display,” March 25, 1953. “White Sox Hand Walking Papers to Bob Elliott,” 1953.